I’m finding it so hard to say anything bad about these. There really isn’t anything. They’re a smart, simple design that won’t cost you and arm and a leg and I’m hoping they’ll last a good few years too. Although they don’t quite feel like the solid, reliable GHDs, I really can’t see them failing too quickly if you look after them. The results are fantastic and only if you have particularly thick or very long hair will you perhaps want something different. These look sleek and give you sleek hair. What’s not to love? Started by a reputed Parisian hair stylist back in the day, BaByliss grew a solid reputation in the personal care appliances industry before being acquired by global giant Conair in 1995. Conair led the company to even greater heights and BaByliss now enjoys one of the top spots in affordable personal appliances. It’s a trusted, household name and provides quality, affordable items. Now this is what BaByliss should be focusing on, sleek, simple products that do their job effectively without any of the guff that some comparable brands have. There’s no bizarre ceramic infusion with unicorn dust here. 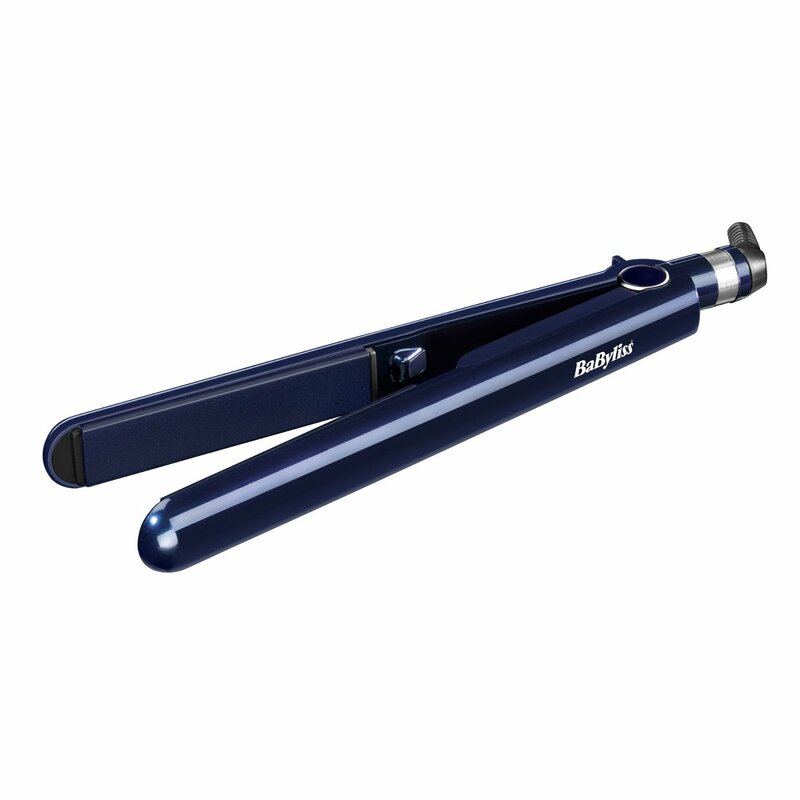 Straight away this straightener looks like it can be trusted and its metallic blue design looks really good. It’s sleek, slim and doesn’t have any clunkiness or annoying extra bits. The curved casing allows for surprisingly easy curling as well as straightening and the plates are smooth ceramic and allow you to do both without snagging or denting the flow of the hair. Results are achieved very quickly and last until showering. The plates are narrow so suitable for short and mid length hair as well as fringes. They can be happily used for longer hair as well as they straighten so quickly. The plates heat up to 235 degrees in fifteen seconds, which is about as perfect as it gets. For this price, it’s easy to see how so many people choose these over GHDs and I wouldn’t blink if you did too. They really are that good. This is the best, most useful technology in a simple package without adding spurious claims in to sell more. I’m a big fan of this set and find it amazing that BaByliss have sets that are quite terrible in comparison. With nano-ceramic plates, these straighteners use ionic technology to give hair that essential frizz-free look and many straighteners do the same. This is the icing on the cake and you won’t find any fly-aways until it starts raining. This has got to be one of my favourite BaByliss products so far and if you did a blind test, there’s a good chance you wouldn’t spot the difference between these and comparable GHDs. NOTE: Don’t do a blind test guys, I was being figurative. Never close your eyes and attempt to use 235 degree products…trust me.